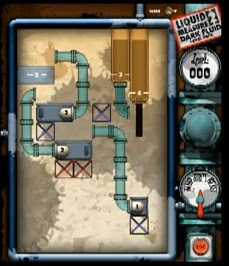 Liquid Measure 2 Dark Fluid Level Pack is the expansion for the LM2 point and click puzzle game from armorgames. Route the water to the container using the pieces of pipes without wasting a single drop of liquid. The container capacity is determined by the number displayed on them sounds easy but figuring out where to place the pipes is the real challenge. The game features nice graphics and entertaining puzzle gameplay with enough difficulty to make you scratch your head a little. Anyways, if you don't know how to beat this game, the complete (LM2DFLP) Liquid Measure 2 Dark Fluid Level Pack walkthrough will show you the solution to all of its levels.